And it’s only spring. The temps are rising into the 90’s here (and I should probably be counting my blessings, knowing how the local weather goes). I am enjoying spending more time outside in the garden– since I work from home most days, it’s a way that I can break up the day. My usual way to break up the day? Snacking. So, just going outside to water the garden once every few hours is a good thing! It’s exciting to see what springs up each day, and now I think everything I planted has sprouted. One of the things that sprung up this week was a pest. Something took down one of my Scarlet Runner Bean plants over a two day period. I asked around and many told me it was probably a squirrel. So, Paul helped me build this cheapo wooden frame, to which we stapled lots of netting. I can still get in and out of there quite easily, and so can the bugs, so I think it will be ok. I’m also using it to tie up my vertical supports, which the three remaining bean plants will be relying on very soon! Another thing that screams summer to me is our clothesline. I may have mentioned this before, but we’re living in my grandma’s house, which doesn’t have the modern convenience of a clothes dryer, dish washer, or a second bathroom. But I really love it, living small. The Texas sun can dry my clothes as fast as any commercial dryer, and it gets me outside and moving around, which is always a good thing. 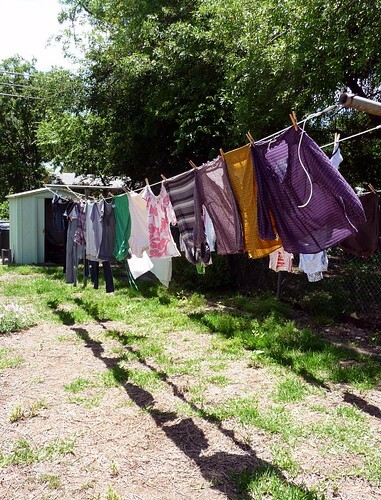 If you have a clothesline kicking around in your back yard, why not try replacing the wires with plastic clothesline (won’t rust) and bringing it back into use? Your electricity bill (and mother earth) will thank you. Meanwhile in crafty news, I’m trying to do some sprucing up around the inside of the house. There is so much work to be done that it’s hard to even want to get started. The perhaps-plan is that eventually we might just move out, get the whole thing remodeled, then move back in. That makes it hard to want to spend too much time fixing things that will eventually get replaced, but, as I’ve moved around a few times in my life, I know that I want my home to nice no matter how long I will be there. So I started off by sewing some new curtains for the kitchen. I used a yard of fabric I bought at Ikea which was nowhere near enough, and paired it with solid green and a graphic black and white print. It’s a happy mix of organic yet not overpoweringly girly, so Paul can live with it too. 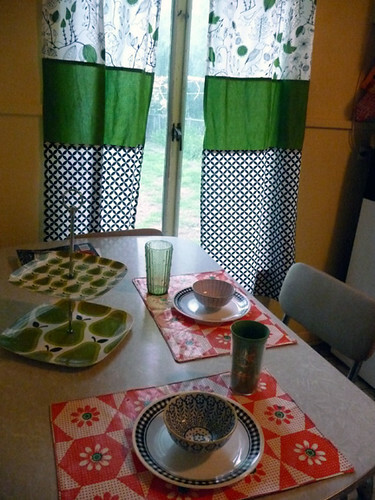 I sewed a smaller set of curtains to go over the kitchen sink, which was a mess at the time this photograph was taken. Who am I kidding, it is still a mess! Currently the kitchen is a faded buttery yellow with faded minty green cabinets, and black and white appliances, and these curtains are my happy way to tie them together. And finally, in news not having to do with the house or the yard, I started a new crochet project for myself (ravelry page link). We had a slow day at the store which always gets my brain going about what to make next. 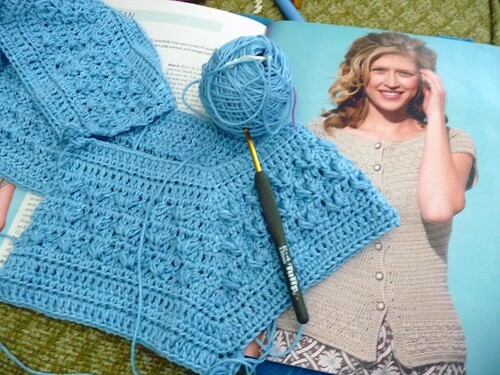 I’m hooking Dora Ohrenstein’s Kristy Cardigan from the Spring 2010 issue of Interweave Crochet. I chose Arucania’s Ruca (viscose made from Sugar Cane) and it’s *so* soft and drapey. Word of warning, the yarn is a little splitty, which can get frustrating when you are working the post stitch patterns, but otherwise doesn’t bother me. I chose this light blue color which I almost never work with or wear. I think it’s going to end up looking great, but it was hard to step out of my usual purple palette. I’m hoping to finish it for TNNA. I can’t actually imagine wearing a sweater, even a short sleeved one, in Texas during the summer except maybe in an air-conditioned restaurant. Or maybe next year, when I’ve adjusted. What’s going on at your house? What are you working on, and what are you looking forward to? The bliss of summer is very eminent now. Your garden is doing good I just hope you'll be able to solve that problem about the pests that are attacking your plants. Have a great day! 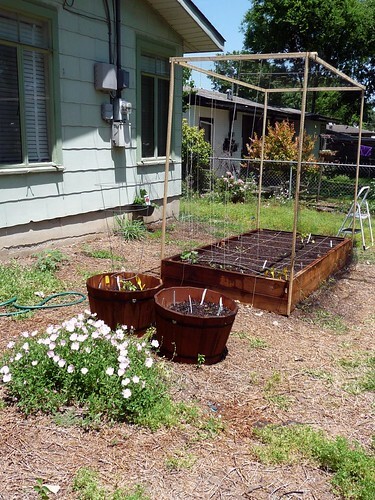 I'm going to try something similar around my garden. It seems the pests have gotten more diverse and grown in numbers over the years. They're eating off all the tiny growing apples and pears in my suburban yard. I've got a bunch of netting I was trying on the fruit trees and I'm going to hope for the best. Last year they even ate my tomatoes. On the crochet front, I'm putting together my shirt made from your pattern in the CA book and will post on Flicker when done, along with a picture of all the bird silhouettes I've been obsessively making. I had made a blue and red one put thru some ribbon to use for a small bridal shower lunch decoration. She LOVED them. Hi Linda- so far the frame and netting has worked-- it only about 10-15 dollars to do and we just nailed the frame right to the side. it sure is frustrating to put in all of the work in and then have some critter eat it right up, isn't it! I'd love to see pictures of your projects when you post them! Be sure to send me a heads up so I remember to look. I love the Kristy cardigan! The color you chose looks great for spring & summer, too. thanks! I'm loving the color even though it's out of my usual range. it's always good to try something new!